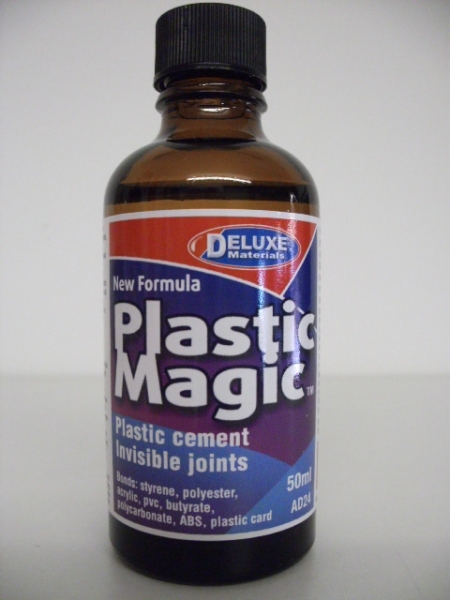 New formula Plastic Magic for the assembly of all types of plastic models apply with a brush or Delux Pin Flow solvent glue applicator. The lenses on my tail lights have always been it great condition, but the trim around them was cracked and even broken off on both sides. I started by separating the trim from the lenses by removing all the screws, and applying heat to the license plate light section that is adhered together. Digging into my old modeling supplies, I pulled out my bottle of Ambroid Pro Weld plastic fusing solvent. I made a small batch of fiberglass resin and used some tight weave fiberglass mat to reinforce the rear sides of the repairs that you dot see. I used my Dremel rotary to cut a slot into the front face of the trim, over the center of the gap section of the repairs. Once everything had cured, I started with 220 grit and started to remove any resin and fiberglass from the repairs that wasn't being used to fill a void or crack. Once the trim was cleaned and left to dry entirely, I began applying light coats of primer to the repair areas and sanding them down to 600 grit between each coat. Once most of the imperfections were filled, I moved to using SEM's flexible plastic filler primer to prime the entire trim assemblies. Once all the repairs were complete, the entire lenses were again entirely primed with the SEM plastic primer, and then sanded down to 600 grit. I let the pieces fully cure for about two weeks, since I was going to be trying something different for the clear coat. I should have grabbed some shots of it out in the sunlight, because it is really an amazing transformation from the original finish. Before re-applying the trim to the lenses, I cleaned and polished them using a regular 3M polishing kit. I used RTV silicone to seal the lenses back to the trim, and siliconed them in a few other spots around the trim to help support them. I will post pictures of them on the car after the car is cleaner, but it is a huge relief to finally see my tails looking like they are brand new. I had a bit of time to tackle something I have been wanting to do for some time with my steering rack. I removed the inner CV's from the rack center shaft, and inspected everything over on the assembly. After looking over the TSRM online, I decided to break the rack down into the component level I needed. After everything was cleaned very carefully, I greased the shaft and housing liberally with some general purpose high temp grease, and placed the shaft inside the housing. Once everything was back together, I masked all the rack ends and plugged the ports so I could dust off the housing in the sandblaster to clean metal. The rack was slapped back in the car, and I do say that it feels soooooooo much easier to move now compared to before. I have alot of updates to add after this much needed holiday weekend, but things are all together for the final assembly and the engine is ready to run. Before you can see there are two separate bodies and as complex as it loos they are only held together by a bit of 6mm spring steel. No extensive road testing yet, but a common mod in the Subie crowd and all rave how much more accurate the car feels for whatever that is worth? Since my last posts, I have finished a few projects restoring trim parts for the exterior of the car recently. You can see a little tiny chip of paint on the hatch were I hit the engine stand and shattered the tail trim that took most of the blow. With the trim turning out so great, I wanted to save the rubber from having any tendency to separate from the body of the trim piece. I decided that I wanted to seal this gap shut, and try to bridge the gap between the rubber and plastic with a flexible sealant. I ended up deciding to use a regular old silicone RTV sealant, and did a quick test to see how nice it laid out with tape'd edges on a piece of scrap plastic. I used powder free latex gloves, and applied a bead of sealant as fast as I could down the length of the trim. An amazing transformation from a set of stockers that were on my less than 100k mile car that barely ever sat out in the sun for its whole life. The tension spring was a real bugger to figure out how to safely remove (and later safely reassembly in the newly painted housing), but I found it easiest to remove the steel spring retainer inside the housing with the spring still in tension, and gently release the tension and remove the spring. I used SEM's flexible plastic primer to build up and sand until the housings were smoothed to 600 grit, then base coated them with Duplicolor Acrylic Enamel Gloss Black. I had previously primed, based and cleared my brake booster after scuffing over the original cadmium plating with a scotch bright pad. I rebuilt both of my master cylinders, but hated how the reservoirs were both terribly stained from the steel cylinder bodies discoloring the fluid. One thing that always bugged me about the 4-runner master cylinder swap, is that no one directly compared it to a stock MKII master for size and geometry. Dedicating some time here and there, I have been repairing some very badly cracked and completely broken sections on the exterior black trim. I rubbed the rear driver side of my car against a mower in my garage back when I was very young (before it was repainted), which caught the rear side marker and tail light trim. Once the glue warms up a bit, it becomes pliable and loose enough to lift the two sections apart without much force. I'm not sure why in my youth I though it would be a good idea to sand the broken edges of the trim down before trying to glue them back together, but I now had a large gap between the trim sections that would need to filled for the trim to properly sit on the lens. I first scuffed the back sides of the plastic with a course 60 grit to promote some decent tooth for the glass to stick to, and the applied a few layers of mat to the sections. I wanted to make a small channel to lay fiberglass into and reinforce the front of the repair. I waited one week between each primer coat before sanding to allow the paint to shrink into the sanding scratches and fully cure. I first scuffed all of the plastic on the lens with a scotch brite pad to remove all of the glossy original finish. I then applied two mist coats, and two medium wet coats of Duplicolor Acrylic Enamel gloss black base coat. After doing alot of online research, i decided to try using SprayMax's 2k aerosol glamour high gloss clear coat. Some of the really deep scratches were still there, but the lenses themselves have always been in pretty great shape and still quite shiny. I am following the same process to redo my mirrors, and some other trim around the car currently. Its amazing how dirty, scratched, and chipped the rack has become from just sitting in the car over the past 2 years, even though the car hasn't really even moved. I removed all the rack lines, the steering servo, the outer rack end cap on the passenger side, and split the case in half at the mated section with the four bolts. I also packed the servo bearing that was exposed with grease, and slathered the pinion and rack teeth with new grease. Then the assembly received a few coats of matte silver enamel, and the final assembly looked great. Their thread pitch is close enough to the metric female threads, so I simply snugged them into the ports with some Teflon sealant. I payed close attention to how easy it was to move the rack from lock to lock with the pressure ports on the rack completely blocked off and sealed, and with them open. I'm lucky that my steering u-joint is in great shape, but I still have a little flex in the system that I can feel at the wheel. I need to read up on the ins and outs of using TunerStudio to do a from-scratch tune on the motor. I know before with just looped lines and some fluid, I could feel alot more of bumps and irregularities travel to the wheel compared to when the car was powered. First, I wanted to post a few better pics of how the tail light trim turned out on the car. This not only looked terrible, but of course did nothing to stop any water from rolling down into my door. I assume its a common occurrence on this piece of trim, but all of my original and my new trim pieces had the small joint between the plastic and rubber that goes over the stainless body starting to slightly separate and open up. I immediately smoothed the bead out with my finger as evenly as I could down the length of the trim, and then removed the tape as fast as possible to leave clean edges on both sides. I had fixed a bad chip on the driver's side with fiberglass at least 8 years ago, and repainted them both with spray enamel. The inside parts needed a good cleaning anyways, and I wanted to properly paint the mirror buckets. The rubber pieces of the mirror were cleaned up with lacquer thinner back to clean rubber, and conditioned with 303 Aerospace protectant. After everything had fully cured, I whipped out another can of SprayMax 2K Glamour Gloss 2-part clear, and cleared the housing with 3 decently wet coats. About a year later, I noticed the paint was simply pushing and flaking off the cadmium plating un-provoked. I also wanted to look at a better option for the brake master cylinder, and bump up to a 1" bore to help offset the pedal feel on the new big brakes. I took a gamble since I didn't know if the push rod and clevis would be a match to the MKII. Since this trim is known to be difficult to find in mint condition and without cracks, I decided to restore my original broken plastic instead of just purchasing a better set. I purchased the side marker new from Toyota, but left the tail trim as I was just able to glue t back to the assembly. I was careful with the heat gun to apply it evenly, and not apply too much heat that would distort the plastic. I sanded the broken edges and faces down to clean plastic, and used the lens as a jig to hold the pieces correctly. I was also methodical to take some chopped fiberglass mat and tiny strips and apply the to the insides of the broken gas to use as a filler material. This was the most time consuming process as I spent most f my time waiting for paint to cure. I had waxed this trim alot in the past, so I wanted to be sure to remove all of the finish down to 100% clean plastic before applying any primer. I cleaned the floors and area as best as I could, but i still got a few small specs of duct in the finish here and there. Previously, I simply looped the pressure and return lines for the rack, and used a small reservoir between the loop to fill and check the fluid level. I shouldn't have used it as bench and footstep while I would crawl in and out of the engine bay! Before splitting the case in half or removing the end cap, I took some time to move the rack center from lock to lock without the servo on the rack, and noticed the resistance and effort needed to move it. You can see the left and right side pressure ports on the rack housing in the picture bellow, where the rack center seal sits between when it is inside the housing. I didn't want to remove the collar completely, because it looked as though it played a decent role in centering the center shaft in the housing of the entire rack assembly. Moving the rack center by hand was so much easier now compared to when it was just air with the seal intact. I didn't need to create a perfect high pressure seal, since there is no fluid in the rack anymore. I may have just been feeling a bit biased, but I thought it was a tiny bit easier with the ports open and not having to move the air in the center of the rack from the left to the right side of the cylinder through the v-cuts I made. Its no worse than any other car that i have driven with manual steering, but I would love to tighten it up some more. Its been many years since I hard to start from zero and get the car to start with the computer, so I want to really get comfortable with the program. The main force of steering is taken by the fluid and the spring steel is just to dampen the steering feel a little. The plastic on the trim piece was also cracked in several sections, being dried out and shrinking over the stainless body. While this wasn't directly an issue now, you can pull the rubber with your fingers and see this gap propagate. While it looked great at first, after a few hours the sealant began to curdle and develop pockets in the finish. Once the RTV cured, I gave the rubber a bit of a tug and was happy to see it was really stuck and secured to the body of the trim. While the paint has held up ok with a waxing each year, the soft enamel was scarred from bugs and other debris hitting the mirrors and being washed off. I started sanding the housings with 400 grit, but noticed the under layers were being a pain to sand out nicely. I decided to go with a 95' 4-runner aluminum brake master cylinder with tandem reservoir inputs, since it was available for a great price brand new and has been proven already to be a direct fit on the brake booster. It ends up that the mounting footprint, and the overall clutch rod length and clevis geometry is indeed the same as the MKII, and they are easily interchangeable. It is getting to the point with these cars that finding better condition trim and parts is either too difficult, expensive, or impossible. And recently this winter, I wasn't very careful when pushing the Supra into the garage and inadvertently bumped the car into an empty engine stand. This was a first test for me, since I didn't know if the solvent would be compatible with the plastic the housings were made of. You use a needle on the bottom to pierce the activator cylinder inside the can and mix the activator with the clear. This clear can easily be sanded and buffed to a glass finish, but I was really happy with the finish right from the can. After noticing and reading up on how this is not really the proper way to run a de-powered rack that was previously powered, I drained all the fluid I could out of the rack and just kept the lines looped together. I also tried a few variations of blocking the left and right pressure ports and moving it, keeping them open and moving it, blocking one and moving it, and looping the ports together. The supplied pressurized fluid is fed into either the left or right side pressure port and applies pressure the center seal in order to effortlessly move the center of the rack in the desired direction. The only other things that would really hold the rack center concentric to the housings were the two oil seals at either end, and the tightened down section of the rack housing where the servo mounts. I was really pleased with how much more efficient the assembly was to move from lock to lock with the little I had to push. With no fluid this can feel like slop, plus im worried if the rod did snap you are left with no steering. I'm sure that spring steel section does help dampen things, but it surely would be best to weld it solid for safety and live with the steering feel. A few friends on the Supra forums gave me some great advice, and always told me to just park and cover the car, and walk away for a while if you have to. It really is these small details that make a huge difference in the overall presentation of a car. After giving up my 2 year search for a set of NOS trim since Toyota discontinued these pieces, I finally bought an ok set from a member here with good rubber on the body. I even tried to seal a strip or rubber to the plastic to see how strong and flexible the bond was. My silicone line wasn't as perfectly even as I wanted from running my finger down and smoothing the bead, but the black RTV blends right into the trim and almost disappears. I decided to whip out the DA sander and knock down the housings to clean plastic as a good fresh start. I then primed and based it with Dupilcolor engine enamels, and cleared it with the activated clear at the same time as the mirrors. With my brake master being aluminum with a shiny new reservoir, I decided to also ditch the stock clutch master cylinder and go with a 95' 4-runner aluminum unit instead. Luckily only the protruding end just tapped the tail light very slowly, but it was cold enough to shatter the trim on the top edge of the black surround. Sure enough, once a generous amount was sucked into the crack and I kept applying pressure, I could feel the broken sections sink into each other as the solvent melted the edges into one another. I used my Dremel to cut slots into the other plastic sections, and used a hot knife to fuse the ends of the repair together. This really helped make the rack mush easier to turn my 245's up front compared to when there way fluid in the system, and I ran the rack this way for years with my 6mgte. One last thing I took notice of was the pinion pre-load bushing inside the housing section that the servo bolts onto. I had gotten so use to my dull and broken tail trim, but now the rear of the car presents like it really should. I saw a few posts eluding to the fact that they were the same, so took the gamble and ordered a $30 brand new unit online. I held pressure for a few minutes, and once I released my grip the sections were very well bonded together. I then sanded everything down and used a bit more fiberglass and resin to seal the repairs. Once the clear is applied, it cures to a handling level in only a few hours, and is fully cured in 24 hours. After doing some research on the internet, talking to a few guys at the shop, and just stopping to think about it while looking at the exploded view diagram of the rack, I decided to try something different again. After everything was broken apart and all the fluid drained as best I could at that level, I laid everything out for inspection. It has a spring that pushes the bushing onto the center shaft where the pinion mates, creating a decent amount of pre-load into the system. Sure enough, only about a year or less would go by and I was itching to get back to work on the car! Remember, the corner parts of the black trim in these pictures were originally shattered in pieces and completely separated. The rubber was however quite hard and oxidized on its exterior, and it was obvious that the trim had been at one time repainted with spray enamel that had now faded. The center licence plate trim seemed to age much worse than the rest of the trim, as the flat bottom section exposed to the most sunlight was beginning to oxidize quite badly. I agreed with this convention when I noticed how easy it was to turn the rack from lock to lock when both pressure ports were open on the rack housing when it was still half assembled. The only complaint and worry that some people had posted about de-powering a rack this way was that there can be a bit of more steering play after this mod, since the tension that was provided by the seal and hydraulic fluid is now gone. I sanded the black plastic sections with 600 grit until the spray paint was entirely removed and clean plastic was exposed. It will be even more efficient if the seal is gone, and any grease I pack into the cylinder can travel from either side of the cylinder without resistance through a few holes in the seal collar. Using a medium-hot lacquer thinner (Sunnyside) on a rag, i started carefully rubbing down the rubber wiper seal on the trim. It comes out in a very generous amount and in a very large fan, like a decent smaller paint gun. I made sure I could break the lock nut and adjuster loose while the rack was out of the car, but I didn't change it any from the stock setting. The solvent did quick work with a bit of pressure to remove all the old oxidation and other contaminants, and soon the rubber was down to perfectly clean fresh material. The paint has great UV and chemical resistance, just like a standard urethane clear that most car finished have. Hopefully I am really happy with the results right out of the box and don't have any of those issues, but I know I can fiddle with that pre-load tension if I need to while the rack is in the car after some testing. You could see all the oxidation and contaminants on the rag I was using to rub it off, until rubbing the rubber left no more residue on my rag. Once the trim was cleaned and prepped to paint, I used a mask and long sleeves to apply the clear. I simply used a screw driver in one end of the housing to depress it while I inserted it back over the rack enter while reassembling the unit. Before it seemed to have the flexibility of hard plastic, but now I could easily flex the rubber with my fingers. My plan to refinish the black plastic was to base coat it black after sanding it to 600 grit, and then clearing it with 2K hardened clear. However, I noticed by accident when rubbing down the rubber that the lacquer thinner I was using was just hot enough to soften a very very thin top layer of the plastic to where it smoothed itself out and glossed up. The solvent then evaporated out of the layer in a matter of seconds, leaving behind a very hard, very uniform semi-gloss finish to the plastic. I was curious to see how this would work across the whole piece of trim, so I saturated a microfiber rag with lacquer thinner and then ran it up and down the plastic trim as evenly as I could, and let it do its magic. What i was left with was an almost exactly OEM looking piece of trim in both gloss level and finish, and I couldn't have been happier. 06.08.2014 at 11:53:56 Passed through many hands before falling train Division Most of the shops are. 06.08.2014 at 12:52:34 Following a year or two in battalion - friendly REME armourers often appear to have. 06.08.2014 at 12:25:29 Entity or corporation employed for the the Westmoreland Mall was renovated in the mid-90's, the famous scale.